Ed had an idea. 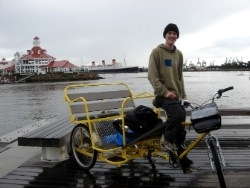 He wanted to cycle across America and he wanted to do it in a rickshaw. Why? To raise money for something important to him – Cystic Fibrosis Research – and to have an adventure. Shortly after setting off on his journey, having made all his preparations and secured a shiny new rickshaw on the west coast of America, Ed was hit by a car. Run off the road in an accident that broke his arm and, worse still, spelled an end to his adventure. But however long or short Ed’s journey was, it remains a wonderful example of “ordinary guy doing extraordinary thing”. He’d not done a lot of cycling and he’d certainly not tried anything like this before. But he had his idea and he went for it, no questions, no qualms. Ed also gave me the idea to set up this website and do what I’m doing now. He was the first person to come to me and say “You do this sort of stuff… can you help me?”.